Is Helldivers really that hard? Yes, yes it is. But its also really good. Read on to find out why. 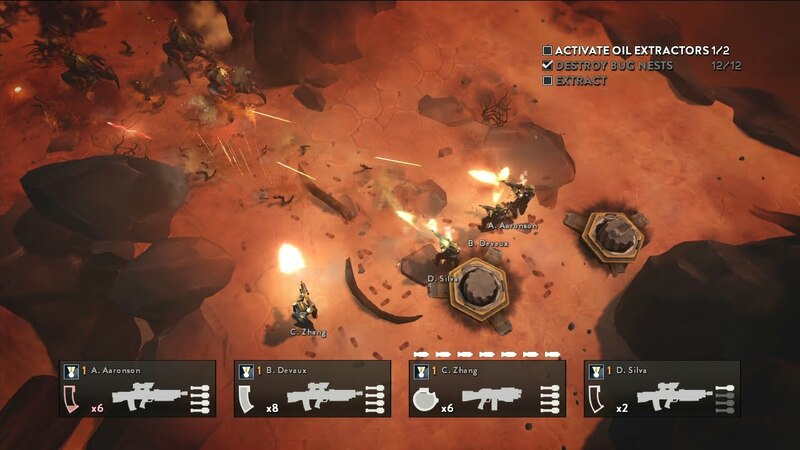 Helldivers is a top-down, shoot-em-up wherein players take on the role of a Helldiver, a soldier in a futuristic war with three alien races. The plot is unimportant to the gameplay and barely present at all. As a Helldiver, you fight for your home planet against alien hordes that seek to destroy humanity. However, this very basic platform serves as an interesting set-up for the game’s systems. Players are not just completing missions to advance their own game, they are advancing the whole war being fought by all the players. Zones on the galaxy map are shaded in as planets are completed and enemies destroyed, giving a sense of accomplishment to the game’s endless grinding. When a player completes all the missions on a planet, they gain influence which not only increases their stance on the game’s leader board but also contributes to the overall progress of the shared world. It’s an fascinating system. Whereas in a game like Destiny I would have liked a more fleshed-out story and world, Helldivers never tries to sell itself as a game with an interesting story but instead it is confident in it’s role as a really hard game about fighting aliens. By completing planets, players can also earn rewards. As with any game, the higher the difficulty of the missions, the greater the rewards. Upon completing a planet, players receive either a new stratagem or an XP boost. Stratagems are helpful upgrades called in during missions to aid the player, and range from auto-turrets to orbital strikes to ammunition. These are called in by holding L1 and entering a series of D-Pad codes and then tossing a beacon to mark the drop site. Drops can actually be used strategically to help thin out groups of enemies as drops crush anything they land on, including other players. Planets in the game are similar to the extraneous planets you could explore in the Mass Effect series. They are not very large and offer little in terms of additional exploration, but are sometimes vibrant and beautiful. Other times they’re barren and empty. Luckily, Helldivers is not about exploration, and the smaller maps feel just right for the amount of content delivered. The developers actually encourage you not to explore too much by rewarding speed. Once dropped onto a planet, players must complete a series of objectives to obtain victory. Objectives vary from mission-to-mission, but usually boil down to entering a series of D-Pad commands similar to stratagems, carrying a box from point A to point B, capturing an outpost, or destroying something. 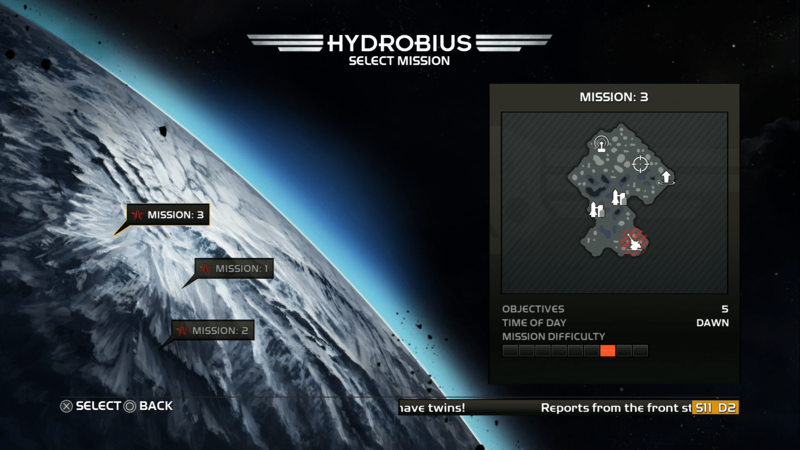 As difficulty increases, these objectives become more complex and numerous on the map. While completing objectives, players must fend off hordes of aliens. Lower-level enemies tend to travel in easily manageable groups of four, but as the difficulty ramps up, so does the number of enemies. They travel in larger packs and more often than not will have at least one upper-tier baddie among them. Even on easier difficulties, it is possible to get overwhelmed quickly. Once spotted by an enemy, players have a few seconds to destroy it before an alarm is triggered and more enemies appear. These enemies can, in-turn, trigger more alarms, calling in more enemies. Time and again, I had to balance my attempts to complete objectives with clearing out an onslaught of enemies. This becomes easier when an auto-turret is deployed, but long cooldown times makes this approach unsustainable for multi-objective missions. This is one way in which I felt that the multiplayer component was almost necessary, as one player could enter the codes while others defended. 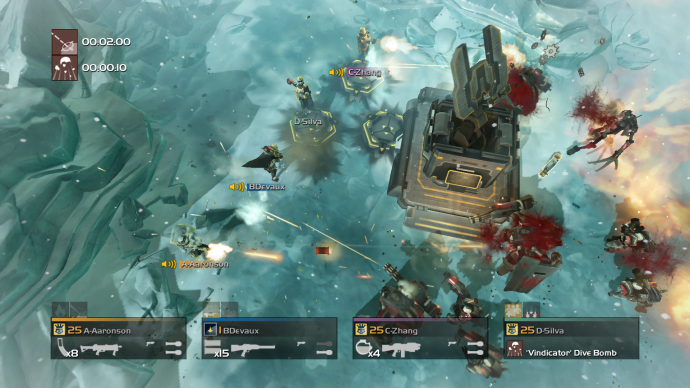 Helldivers is a game built for multiplayer. Lower level objectives and enemies are easily handled by a single player, but it just isn’t as fun. Once you get to the third difficulty tier, labeled“Easy,” it becomes a lot harder to go it alone. Missions allow for four Helldivers to enter the fray, and the game supports both online and local co-op. While online play is fine, I had a lot of difficulty getting into matches as they tended to be full up or I would be rejected. The game allows for a random matchmaking system where players can refresh the list of available games, which tends to happen quickly with the short missions. Players can also set up games within their friends lists. The best way to play multiplayer, though, is local co-op. Communication is crucial to co-op play, and the easiest way to do that is by sitting next to your friends. While co-op certainly makes certain aspects of the game more manageable, it does not make them easier. Friendly fire is always on, so you have to be careful not to accidentally kill your buddy while tracking your enemies. Helldivers is a polished game where everything seems to work well. There is some area for improvement in the online multiplayer, but as more players join the fight, this will likely balance out. Helldivers is very ambitious, creating a massive shared universe that feels like what Destiny should have been. One of the best features is that this game is cross-buy, cross-save, and cross-play. Helldivers is an excellent game. The intense difficulty level ensures that even the most seasoned players will be challenged, coming back for more with each death. Do yourself a favor and check this one out.